We’ve just passed the 97th anniversary of the Battle of George Square, when a mass strike in Glasgow was brutally attacked by the police in 1919, sparking riots across the city and the calling in of the military. As happens with these things, a deluge of memes appeared on social media to mark the occasion. 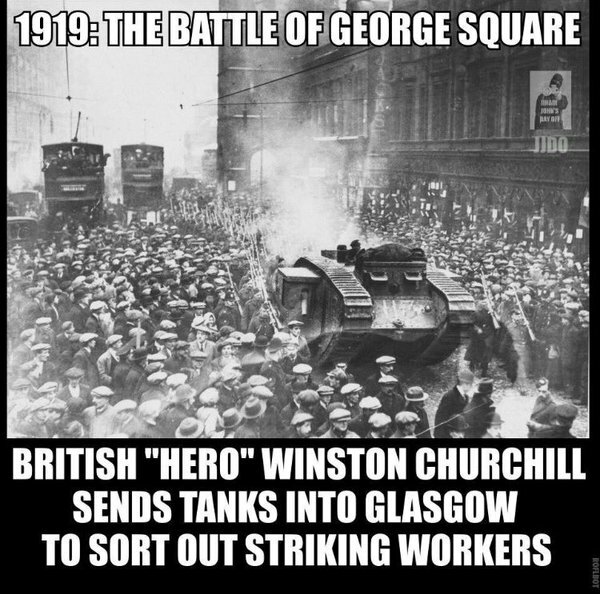 Unfortunately, one of the pictures that was doing the rounds – alleged to be of British tanks occupying Glasgow in a bid to put down the working class rebellion that had gripped the city – is actually nothing of the sort. As we’ll prove below, it couldn’t be of something more different: it’s a jingoistic propaganda procession by the British military, raising funds for the mass slaughter of the Great War, instead of anything remotely radical. But this inconvenience hasn’t stopped the photo being repeatedly used by both its copyright holder – the Herald and Times group – and everyone from the BBC, the Scotsman, the Guardian and a slew of Twitter memes that purport it to be of the military occupation in late January 1919. When STV produced a documentary about the events a few years ago, they padded it out with some random tank footage that isn’t even in Glasgow. With the centenary of the Battle of George Square just three years away – and a likelihood that it’ll be marked by national commemorations and events – it’s probably a good thing that we get the truth about this photo out the way now, rather than contuinue this falsification. It’s an incredible photo by all accounts and provides a fascinating perspective, capturing the tank trundling along the street and the stoic faces of the working men surrounding it, the old Glasgow trams and the soldiers and policemen lining the route. Attach to it a narrative of English troops invading the city to put down Glasgow’s working class rebellion – and with its setting instantly recognisable as the Trongate – it’s little wonder it resonates so much and is so frequently reproduced. It’s just a shame it is of something totally different. 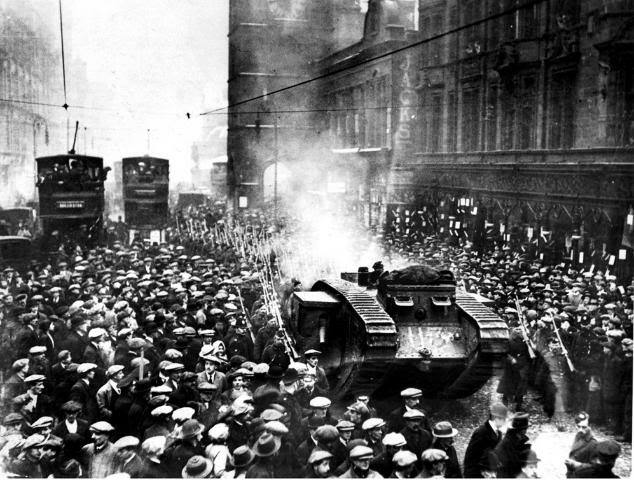 In fact, although both Scottish and English troops and armaments were sent by rail into Glasgow the day after the Battle of George Square, there’s no evidence that tanks actually took to the street. Rather, they were held in the cattle market on Bellgrove Street, although machine gun placements were set up in the city centre. It’s also true that local troops were kept in their barracks rather than be deployed. The parade that the Herald is describing here is exactly what appears in the photo that’s been continually reproduced as showing the rather different events of January 1919. We’re not the first to speculate about this though, with some collective sleuthing on the Urban Glasgow forum into it a few years ago. On that post, it was pointed out that the Trongate tank bears a startling similarity to Julian, even bearing the same distinctive ‘113’ marking. The Julian tank was also a different type to those deployed to quell the unrest in 1919 – a Mark IV rather than the Medium Cs that there’s photos of from 1919. How the photo ever came to be mislabelled by the Herald is a mystery – perhaps an honest mistake by a picture editor in a decade gone by. What a change a year makes: clippings from the Glasgow Herald – January 1918 (left) and February 1919 (right). Glasgow would go on to raise more than other city in its “Tank Bank” contributions, with the Herald reporting it was “beseiged by investors from all classes”. Exactly a year later, that same square would see heavy clashes with the police as demonstrators raised the red flag, and shortly after, troops occupying strategic points about the city. This was not exceptional, with similar scenes of working class unrest across the continent, but it’s still important that we remember what happened then and its role in the city’s working class history – and remember the less comfortable aspects of it, like the anti-black rioting on Broomielaw the week before too. Huge public interest in the Battle of George Square lives on, as seen with the recent viral post on the Lost Glasgow page on Facebook, which received 14,000 likes and 9,000 shares. Of the thousand odd comments left below, many commented that this was the first they’d heard about it. But with the centenary coming up in three years, let’s stop spreading the myth of the Trongate tank, which only does a disservice to the real events of 1919. Post-script: being a boring pedant with nothing better to so, I emailed the Sunday Herald about this after they published the photo in September 2014, asking if they would raise it with their group picture desk. No response was ever received. Post post-script: In January 2018, we were contacted by a historian who, after looking into the events of January 1919, had contacted The Herald and was in discussions with them about correcting the historical record of this photograph. Having dug out the photo from their archives, contained in the Mitchell Library, the Herald reporter was initially confounded after finding “1919” pencilled on its back. 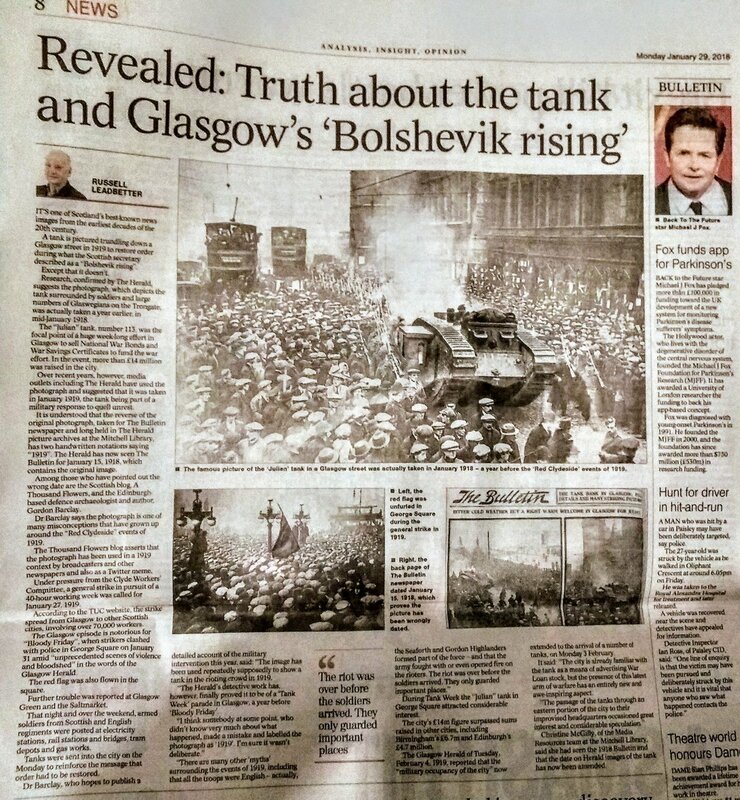 However, further digging then found the photo adorning the back page of the Glasgow Bulletin in… January 1918, alongside another photo of the “tank bank” parade, thus settling this story once and for all. On 29 January 2018, the newspaper published their findings – including a wee mention for this blog. Thanks for pointing this out. I hate sharing something, seeing it going viral, thinking I’ve done a good thing by helping spread word of something people (should have) but have never heard of, relating to their own country’s history, only to be shown the original story wasn’t as presented or something. I wonder if you were ever exposed to the history of the potato famine that ravaged the highlands of Scotland for 11yrs (from 1846-1857), would be great if you had a link to any of those that were ere to online but have since ‘disappeared’? Many were also displaced within the country (moved to lowlands) these people (Gaelic speaking Scots who bled the ground red for lowland ‘royalty’ and to ensure the safety of our borders) ended up hated for taking jobs for less wages than the lowlanders were willing to do them for), they were subsequently lumped in with the starving Irish on account both spoke slightly different versions of the same language (Gaelic). Here’s where the real sectarianism/racism and division was really born into working class Scottish society, and I don’t know if that was also intended or if it fell into their (London’s) lap as an unexpected ‘bonus’, keeping Scots divided and in each other’s faces. And of course we know it’s been worked and manipulated ever since, whenever they feel the need, with it rearing it’s head and playing no small part in our first independence referendum 2 years ago. The famines that ravaged largely Gaelic speaking Ireland (at the time) and (highland) Scotland I believe was nothing that happened by chance. It hit those two places but skirted England, Wales and the lowlands of Scotland. Prior to the clearances, a run of famines and Scots being on the front line of every war the Brits have ever instigated, it was said 60% of Scotland’s population had resided in the highlands. Indeed, at the act of union (of crowns in 1603) the ratio was said to be 1 Scot for every 4 English. Now it’s roughly 10 or 11 to 1. If the ratio was still 1 in every 4 English, what would Scotland’s population be today? 15m or something? Well done you anyway for digging up the truth and I just wish more could be obtained and produced online about Scotland’s own travails. For some reason, even the articles I’d found online about this famine (The Highland Potato Famine) have since disappeared and seem to have been replaced with other articles playing down the scale and massive loss of life (either through death or deportation). I shared them with as many people as I thought would be interested back in 2009, but they all appear to have gone now. Most disappeared from social media through the reformatting of FBs groups and some existing weblinks led to pages that said the site had since been shut down. Hopefully the articles we initially had that omitted nothing, leaving you angry reading it if you were a Scot (or even if you were just a decent minded person of any nationality) hopefully somewhere some of them’ll have been saved by someone and can be found again and revealed to this generation’s people again. Not to sew hatred and division between peoples of nations, that would be regressive and would do nothing to advance society or the social union between people on these islands, rather i think it’s important to show people what the UK establishment have been doing with and to our people from the start of this “union” to the (hopefully soon to be) end of it. Thanks for doing this. I gave up trying to point out that the photo was from 1918 not 1919. One question how did the six tanks get from Glasgow central station to the meat market Fly? Absolutely, the six tanks had either to travel from a rail terminal (possibly Glasgow Central or next to Bellgrove St). Evidently, they must have at least traversed a couple of streets to enter the Abbatoir where they were kept ( there are photos to prove this). I would suspect that their movement would have occurred in the dark early hours – to minimise witness observation. Wow… I have seen some sheep in this world, but you crowd are the icing on the cake – Can I suggest that you actually do your own research – Even the BBC print the truth. http://news.bbc.co.uk/1/hi/scotland/glasgow_and_west/7859192.stm You really need to start finding Scottish History that is being taken away from us. While we have old newspapers in the libraries, get in there and read the truth. I have heard this picture described as “a touring, tank-themed funfair” That is obviously what is was, look at all the women and children in the photo. Get some real info from books such as When the Clyde Ran Red, Revolt on the Clyde, or John Maclean. lol did you read anything in the article David? we DID do research – based on old newspapers – and refuted the mythical narrative attached to one photo. what’s your source? we have detailed all of our sources above.